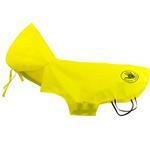 Keep your dog and car clean and dry with the Body Glove Dog Raincoat and Free Car Seat Protector Package in Yellow! Now with two convenient openings for either collar or harness attachment! Design provides for Easy On/ Easy Off donning. 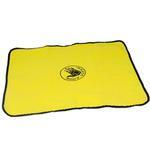 Waterproof material provides an excellent barrier against dirt/dust, rain, slush chemicals, and wind. 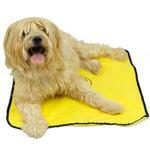 Helps prevent "Wet Dog" odor . This innovative dog raincoat with it's two convenient leash openings to fit either a collar or harness combined with it's two rear leg elastics preventing the raincoat from lifting up during windy conditions, sets this raincoat apart from all others! 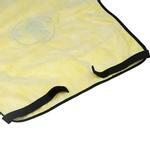 And now keep your car clean and dry with the free car seat protector valued at $9.99 that conveniently attaches to your car seat with Velcro elastics! 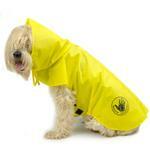 Body Glove Dog Raincoat and Free Car Seat Protector Package Customer Photos - Send us your photo! Here is Essee, my 2 year old Feist modeling her new raincoat. Fits perfectly! My product purchased is quality made . I have a Pomeranian and the medium size fit too snug, so I ordered a large, which is much better and have returned the medium size item. Item is a Puppia Raincoat.